If you cannot remember your renewal date or have questions, please call (800) 989-8137. We are not affiliated with the Dept of Veterans Affairs. 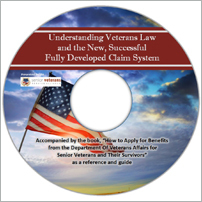 "CLE Course - Understanding Veterans Law and the New, Successful, Fully Developed Claim System"
The Online Course will be emailed to you immediately after purchase. The DVD Disc, Course Certificate, and Book will ship to you via mail. * 1 course per user. Volume discounts available for additional courses or course certificates. Please contact us to discuss. 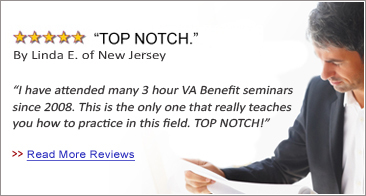 This Continuing Legal Education Course (updated in April, 2017) is approved by the Department of Veterans Affair's Office of General Counsel and will meet the mandated first year CLE requirements or any ongoing 3 hours of CLE on veterans law and procedures required every two years (see 38 C.F.R. § 14.629). Future follow-up from our staff to remind you of submitting your yearly VA good standing certification and also notifying you of your next anniversary for CLE training. to navigate through VA's proposed rules changes regarding pension (including the 3 year look back and penalties for transferring assets). 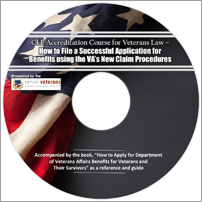 "CLE Accreditation Course for VA Law – How to File a Successful Application for Benefits using VA’s New Claim Procedures"
This new Continuing Legal Education Course was updated in October of 2018 and is good for 2019. It was approved by VA's Office of General Counsel in 2018 and will meet the mandated first year CLE requirements or any ongoing 3 hours of CLE on veterans law and procedures required every two years (see 38 C.F.R. § 14.629).